Put your feet up with this luxurious ottoman. A plush seat cushion is ideal after a long day at work. Pair with the matching chair to complete your set. Available in a variety of fabrics and leathers. 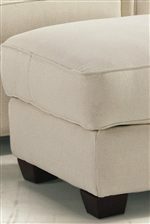 The Cigar Upholstered Ottoman by Klaussner at Value City Furniture in the New Jersey, NJ, Staten Island, Hoboken area. Product availability may vary. Contact us for the most current availability on this product. The Cigar Collection is inspired by the retro style and comfort of Hollywood's Golden Age romantic era. 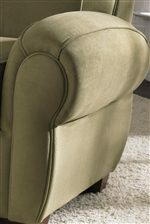 An attached back, enhanced rolled arms and exposed wooden legs combine to present a magnificent design and feel. 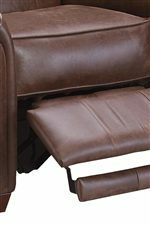 This collection includes the sofa, chair, high reclining chair, ottoman and love seat (not shown) and is available in a wide variety of fabrics and leathers. 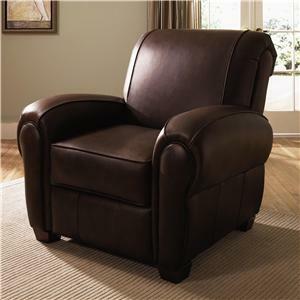 Find the perfect fit for your home with an addition from the Cigar Collection. 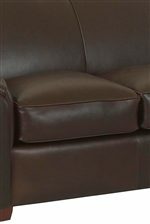 The Cigar collection is a great option if you are looking for Casual furniture in the New Jersey, NJ, Staten Island, Hoboken area. 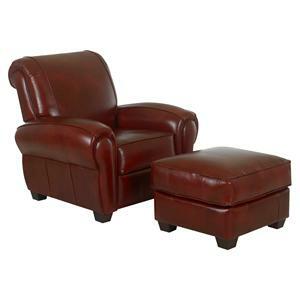 Browse other items in the Cigar collection from Value City Furniture in the New Jersey, NJ, Staten Island, Hoboken area.